so by the end of february i got my another packet which arrived safely at my home..
send from JAPAN! 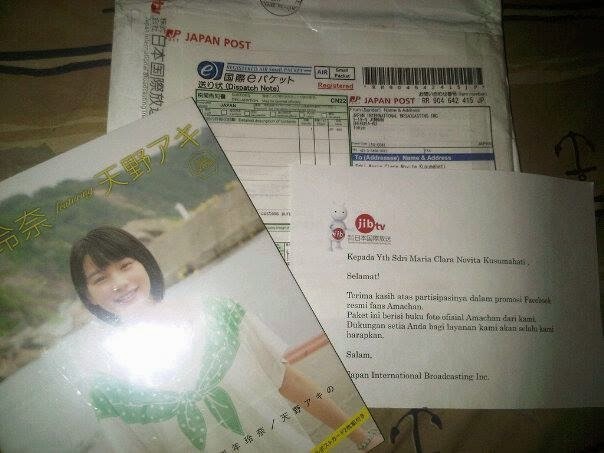 wow so excited..
i got a ama-chan book give from JIBTV Facebook Fanpage..
just took it by my phone camera..
Where you can watch Ama-Chan? just for Indovision or Okevision subscribers..
so! hurry up sign up to start subscribe Indovision or Okevision channel. then you can enjoy watch Ama-Chan Program TV at your home..
How to subscribe TV Cable Indovision or Okevision? by click the link below you can see packet channel TV offer by indovision and okevision..